Rats and Mice are a common pest we deal with around Cairns, in their many forms they can destroy crops, infest homes and properties to creating issues for our beloved house pets. Rats and Mice are primarily nocturnal pests. They have very poor eyesight but make up for it with their great hearing and smell senses. As a pest in Cairns, the biggest issue these guys cause is the gnawing and chewing of electrical wiring in roof voids and wall cavities, this can lead to electrical shortages and potential fire hazards, also a serious safety hazard for anyone climbing through your roof space. One of the first signs a home owner will know they have a rodent infestation is from noticing noises in the roof void or wall cavities, it is also common to be sitting on the patio only to have a cheeky rat run past you, often you will also start finding droppings around the place, if they are shiny and dark generally this means they are relatively fresh and new. 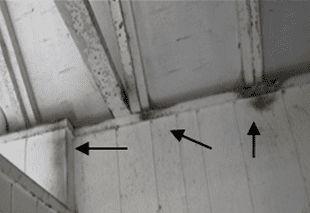 Another tell-tale sign a home owner will notice is runways and rub-marks on walls or joists etc. Rodents have an oily residue on their coat which after running on the same route several times this residue will start to mark the walls and objects that it rubs against. ​​What are some things you can do as a home owner to help prevent rodent problems in Cairns ? Number 1 is Sanitation – Avoid throwing scraps around the yard and try keeping your kitchen benches clean and tidy and regularly clearing out the rubbish bins that have food scraps in them. Other areas that rodents are regularly found nesting around and searching for food around are compost bins, chicken coops, stored timber/items etc. Number 2 is Rodent-proofing – In a tropical city like Cairns, trees grow very rapidly and before you know it are touching the eaves of your house, this is a one of the most common ways in which you will end up with a rat problem in your roof, try and keep all trees and shrubs cut back and clear from touching the sides of your house, doing this alone will greatly reduce the likelihood of having a rat problem in your roof. What does Pest Off Solutions do if you have a rat problem ? We will come out to your property and ascertain what species of rodent you’re having trouble with and implement a rodent program to help you rid your home of these pests. With the latest in rodent baiting devices, glue boards, and rodent traps we will install and do follow up visits until the problem has ceased. If you’re having any rodent troubles that you want a professional to come and sort out, contact Pest Off Solutions and we’ll rid your home of these pesky critters. Trees and shrubs providing easy access for rodents.